Tova Weinberg has been a matchmaker for nearly three decades and more than 120 of her set-ups have resulted in marriage. As a single mother of four living in Jerusalem and running her own law practice, it wasn't clear to Esther Sha'anan that she would ever remarry. "It's not easy to meet someone appropriate," the religious American expatriate told JEWISH FAMILY LIFE. "[A] few people consistently tried to set me up. Everyone else wrote me off." Except for Tova Weinberg, that is. A family friend and internationally known matchmaker, Weinberg had always kept Sha'anan in mind during the 15 years that Sha'anan was single. In December 2003, Weinberg co-founded Saw You at Sinai, an Internet-based matchmaking service that enabled Jewish matchmakers worldwide to pool information and exponentially expand their networks of singles. Weinberg insisted that Sha'anan register with the site, and when Sha'anan refused to post a photo with her profile, the Pittsburgh-based Weinberg affectionately browbeat her by phone until Sha'anan did so. A few months later, Sha'anan, who was then 45, received another phone call from Weinberg, this time asking her if she would go out with Richard Landes, a good-looking, intelligent, divorced father of two who taught history at Boston University. Sha'anan was interested, but told Weinberg that she didn't go out with men who didn't live in Israel. Weinberg encouraged her to look past logistics, however, and Sha'anan agreed to give it a try. Landes flew to Israel in April 2004, and the two met for the first time while strolling through Jerusalem. "It took two dates to figure out that this was something very serious," recalls Landes, who proposed just over a year later and is currently in the process of making aliyah. "There were other people who knew us both, but it did not occur to them to set us up. Tova had an instinct." To be sure, if numbers are any indication, the thin 50-something does indeed have a knack for making matches. 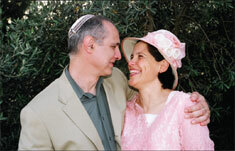 In her 29 years as a volunteer matchmaker, Weinberg has introduced over 120 now married couples, 20 of these through the Saw You at Sinai Web site (www.sawyouatsinai.com). Moreover, of the 20,000 members on Saw You at Sinai, Weinberg has worked with about 9,000 and is the primary matchmaker to 1,000. "She has made the most matches [of the 300 matchmakers] on our site," says Marc Goldmann, co-founder and president of Saw You at Sinai. In the world of informal Jewish matchmaking, "she is one of the top two or three out there," he adds. "Whenever I talk to people, rabbis...they are blown away by her numbers." In contrast to dating-service sites like JDate, where members take responsibility for selecting their own matches, Saw You at Sinai employs matchmakers to review member profiles and set-up potential partners. While the site is primarily geared toward Orthodox and traditional Jews, Goldmann recently unveiled JRetromatch.com, a sister site for non-Orthodox and unaffiliated Jews, which he says has about 8,000 members. JRetromatch launched in response to the growing popularity of matchmaking within the general U.S. population. Indeed, the Matchmaking Institute, a New York-based matchmaker-certification organization, reported that in 2006, the industry raked in an estimated $250 million among 1,500-plus matchmakers. But while some such professionals charge upwards of $10,000 for their services, Saw You at Sinai and JRetromatch members pay just $10 to $20 per month and get to personally select their matchmaker, all of whom work for free. 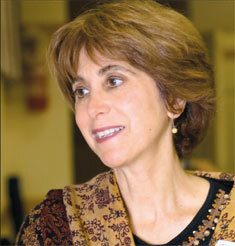 "A shadchan [matchmaker] has to get involved," Weinberg explains of dating in today's world. She also works with non-Orthodox Jews under the auspices of Saw You at Sinai. "When I see a profile and I know both of them and the guy rejects it, I'll call him up and I'll say, 'listen buddy, you rejected so-and-so, but you don't know if this is [meant to be].' Ninety-nine percent of the time they will accept her again. Most of the time, they need a little nudge." On a cool Jerusalem evening in April, a Saw You at Sinai party is underway at a beautifully appointed villa in Jerusalem's desirable German Colony neighborhood. The 15 percent of the 20,000 singles on the Web site who live in Israel have been sent invitations, along with a large cohort of North Americans and Brits who are in town for Passover. Fashionable but modest women in long skirts lean against marble tables, nibbling at appetizers, while clean-cut men in knitted kippahs and dress shirts attempt to chat them up without touching. The presumption among the largely Modern Orthodox group is that the men and women, aged 25-45, are here to meet strictly for marriage. Over this scene presides Weinberg, who helped organize this event and whose name at the top of the invitation is partly responsible for the 175-plus turnout. Brooke-Astor-like in her plaid silk evening gown, she flits from single person to single person, whispering words of encouragement: "You look gorgeous, gorgeous," she confides to a frightened-looking woman standing near the wall, who then lights up with confidence. Then Weinberg darts over to a 20-something man in a dark suit, visiting from New York. "Have you met anyone tonight?" she prods. Many of the singles in the room know her, and their faces register welcome, and sometimes relief, upon seeing her. "Tova can approach people out of nowhere and find out if they're single," says fellow matchmaker Diane Burstein, 54, of New York. "She is very friendly and she has the time to do this." And yet, while Weinberg seems to be a natural-born Yenta, she didn't find her calling immediately. One of six children born to a strictly Orthodox homemaker mother and financial advisor father, she grew up in Detroit and attended a Bais Yaacov school before enrolling at Wayne State University. After college, she moved to New York to enroll in dental school at New York University and to "find a husband." Ever the extrovert, she met him at age 25 at a party on the Upper West Side. "I had dated everyone else in the room so I approached him and said, 'You're the only boy I haven't dated.'" They went out a few months later, married in 1979, and two years later, moved back to his hometown of Pittsburgh, where he worked as a pulmonologist. Weinberg introduced Richard Landes (left) and Esther Sha'anan (right) in 2004, and they married the following year. Once there, Weinberg says she discovered what she describes as a "crisis" in American Jewish life: the incredibly high intermarriage rate, especially in smaller Jewish communities. "Instead of hating them for intermarrying, I said I need to do something about it," Weinberg explains. And so she left dentistry and began collecting in a notebook the names of every Jewish single she came across, observant or non-observant. "I started setting them up. I had parties at my house." Over the next two decades, her notebook swelled to 2,000 names across the country. Then, eight years ago, she got a call from Goldmann, who had heard about her through the dating grapevine. He told her that he wanted to start a matchmaking Web site and needed her advice and database of names. Though she thought it sounded too good to be true, Weinberg agreed and three years later, Saw You at Sinai launched. Since then, 300 additional matchmakers have joined the site, which now enjoys instant name recognition in most Orthodox homes. These days, Weinberg is on the Internet by 5:30 a.m. six days a week, answering emails, sending profiles of potential matches and following up with members all over the world who have gone on dates she set up. She also throws six singles parties a year in Pittsburgh, Jerusalem and New York, and is the official onboard matchmaker for JSingles, a company that hosts kosher singles cruises to the Caribbean and Baltics. With four of her five kids grown and out of the house, she stops working promptly at 9:00 p.m., when her husband comes home from work. "I have to give him a little bit of attention," she deadpans. "I don't want to get divorced because I know what's out there." Still, the self-described "matchmaking addict" spends every free minute on the phone or in front of a computer setting up singles. Indeed, part of Weinberg's success, according to Goldmann, is that she takes this as seriously as a Wall Street job. "Tova is about getting people to meet each other," says Landes. "It's about real relations and not fantasies of what [people] want." "Her ability to see beyond [the surface] is tremendous," adds Sha'anan. "We are both eternally grateful to her." Simona Fuma is the Israel editor of World Jewish Digest.